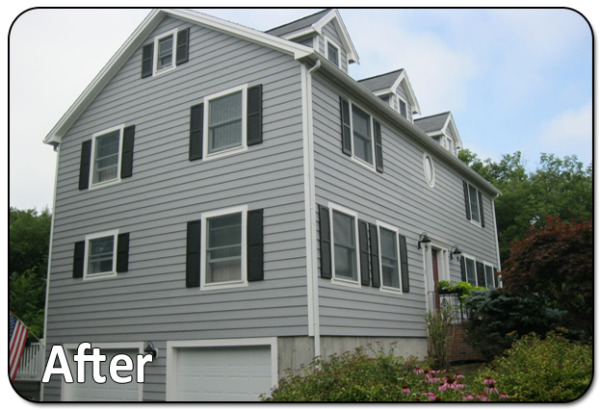 Danvers, MA, home to many of our customers who decided to install Everlast Composite Siding. Those who are looking for quality siding contractors should look no more and see first hand the marvel that Everlast Composite Siding is. 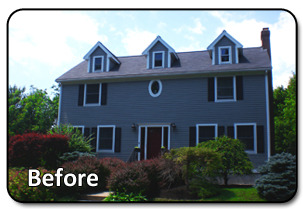 This colonial home went through a refreshing process of installing new siding. The home previously had old siding that had been painted over at least 4 times within the home's short life of 18 years. I know I would be tired of having to burn a hole through my wallet every 4.5 years to make my house look nice and as were the homeowners. The homeowners were searching for a siding that had very little to maintenance after all the years of having to deal with paint issues and soon after they came across Everlast Composite siding. It did not take much time for them to decide on the siding for their home, Seaside Gray was the color of choice and 7-inch Everlast Composite was the siding. What a great choice it was, granted I'm a little biased because Seaside Gray is one of my favorite colors, but hey I think its a fair statement to say that the home looks great! The home required a complete demolition of its old siding and trim. The window and door flashing was replaced with a anodized aluminum flashing and the new siding and trim were fastened by stainless steel, ring-shanked nails.